Canada has been an increasingly popular area for real estate investment for decades, and this trend isn’t expected to die down anytime soon. From the Rocky Mountains to French Quebec to the West, there is an area in this country for every interest. Keep reading to learn all about some of the best places for real estate investment in Canada this year. Sherbrooke, where property is cheap when you buy and is all but guaranteed to increase in price when you sell. Whether you’re a homeowner looking to rent out your property or a real estate investor looking to buy low and sell high, this city is the ideal place to start. In the past year alone, property value increased by an average of over 20 percent. Residents love the area as it’s a happy medium between an urban environment and a natural setting, making it a great place to live for young professionals and families alike. Also in Quebec is the lovely city of Trois-Rivieres, a great location for first-time homeowners. Though it is the oldest industrial city in Canada, the rise of tech and renewable energy industries make this a growing city worth investing in. Property value increased by almost 12 percent in the past year, and it’s expected to continue growing. 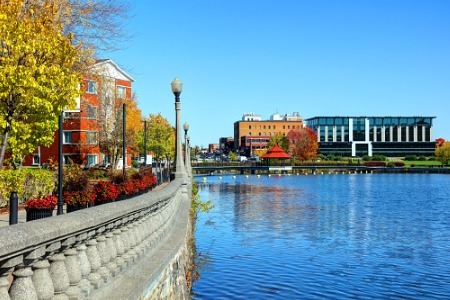 This riverside area is the ideal balance between natural beauty and an increasingly urban setting, and you can’t help but be charmed by the French-Canadian culture. Domestic and international investors keep Kitimat on their real estate radar. Though it is a small community of less than 10,000, due to the region’s natural gas market the area is employing thousands of construction workers, making the city’s population mostly renters. Thus, real estate investors are looking to Kitimat as an city to purchase homes to rent to those needing more long-term leases. Last year, Kitimat was named the #1 best investment town in Western Canada, so real estate enthusiasts should jump on this opportunity if they haven’t already. Just 15 minutes from Calgary, Okotoks is one of the fastest growing cities in Canada. Okotoks is not only a popular city for millennials but also a destination for commuters, a rising location for small business owners, and, of course, an increasing area for real estate investors looking to rent out their property. This city immerses you in picturesque views of Canada’s Rocky Mountains and is filled with enough recreation and lively activity that residents love to take advantage of. Both downtown Toronto and the Greater Toronto Area are excellent areas to invest in this year. People worldwide are flocking to the city for its excellent location, beautiful scenery, diverse population, and up-and-coming food and social scene. The Greater Toronto Area sees almost 80 percent of Canada’s population growth year after year, and this trend is not expected to change anytime soon. With bustling business opportunities and a rapidly expanding housing market, investors should take advantage of this real estate paradise.